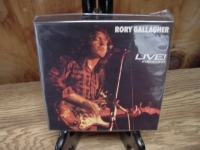 "Rory Gallagher, Live" In Europe - OBI Box Set of 3 Minis"
RORY GALLAGHER - LIVE! IN EUROPE - Japanese OBI MINI REPLICA LP TITLES making a 3 CD Box Set- Japanese OBI MINI REPLICA BOX SET Japanese re-mastered Mini LP replica Limited Edition Collection Recorded from the finest Original Masters available. Each title Comes with anti-static sleeves similar to Vinyl LPs, Cardboard packaging exact to the original LP, Re-sealable plastic wrap cases for protection of each collectible and includes extensive Liner Notes Booklet. Actual miniaturized version of the 12" LP in 4" CD version Special VERY RARE LIMITED EDITION BOX SET ONLY PRODUCED ON FUTURES FOR THIS ONE TIME PRESSING -- were only available in Japan. THE BOX SET - INCLUDES LIVE! IN EUROPE - Track Listings 1. Messin' With the Kid 2. Laundromat 3. I Could've Had Religion 4. Pistol Slapper Blues 5. Going to My Home Town 6. In Your Town 7. What in the World 8. Hoodoo Man 9. Bullfrog Blues IRISH TOUR - Track Listings 1. Cradle Rock 2. I Wonder Who 3. Tattoo'd Lady 4. Too Much Alcohol 5. As the Crow Flies 6. Million Miles Away 7. Walk on Hot Coals 8. Who's That Coming? 9. Back on My Stompin' Ground (After Hours) 10. Maritime STAGE STRUCK - Track Listings 1. Shin Kicker [Live] 2. Wayward Child [Live] 3. Brute Force and Ignorance [Live] 4. Moonchild [Live] 5. Bad Penny [Live] 6. Key Chain [Live] 7. Follow Me [Live] 8. Bought and Sold [Live] 9. Last of the Independents [Live] 10. Shadow Play [Live] These are Japanese digitally re-mastered Mini LP replica CDs (the OBI Edition). This Limited Edition Collection has only VERY FEW made world-wide and are immediately Out of Print. Recorded from the finest Original Masters available. Comes with anti-static sleeves similar to Vinyl LPs, Cardboard packaging like an LP, includes extensive Liner Notes Booklet. Actual miniaturized version of the 12inch LP in 4inch CD version.